Instance leveling is by far the fastest way to level your World of Warcraft character, but there are a few tips and tricks the experts use to make instance leveling get them to level 85 even faster. After all, instance leveling on its own will make your leveling experience fly by, but following these tips and tricks will turbo-charge your leveling experience. One of the easiest ways to get more experience with every kill is to make sure that you have rest bar every time you are playing. Rest bar is earned when you log out from inside an inn. You basically build up rest bar for all the time you spend in an inn, including the time you are logged out inside an inn. Rest bar gives you twice the experience for every single kill, including all the ones inside the instances. Whether you’re instance leveling or not, make sure that you log out inside an inn every single time you leave the game. Another important part of instance leveling is completing instance quests. The quests that can be completed inside of the instances give twice the experience that solo quests do. Plus, completing instance quests is like getting two for the price of one. You get the fast-paced experience from killing larger mobs more quickly in a group, and you also spend that same period of time completing a quest that will give you even more experience after you turn it in. As far as convenience goes, you just can’t ask for anything better. Another little-known way to earn more experience in less time is bind-on-account gear. If you already have a level 85 toon, then you’ve got to invest in some bind-on-account gear. This gear is available from Heirloom badge vendors in Dalaran. You will have to trade some of your Triumph badges down a couple of levels to get the Heirloom badges, but it’s well worth the trade to get the bind-on-account gear. There should be three or four pieces of gear that are bind-on-account, which means any of your toons can wear them. You can even trade them back and forth among your characters after one of them has already worn the bind-on-account gear. But what really makes all that bind-on-account gear worth your time is the little experience bonus each piece has. 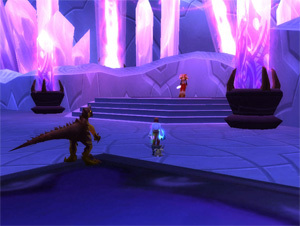 Three of the pieces have an extra 10 percent bonus to experience earned from both kills and quests. Any WoW player who uses all of these extra little tips and tricks while instance leveling will truly reach level 85 in a record amount of time. Just when you think you’ve figured out the fastest way to level, something new comes along to make it faster. After all, Blizzard knows that the players who stick with the game through level 85 are the ones who will be most likely to play it for years, and the easiest way to get people to stick with it is to offer ways to make leveling go by faster.